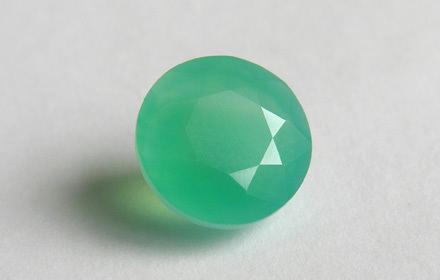 Weight: 2.70 ct; size: 9.17 | 9.17 | 5.70 mm; shape: round; colour: medium very slightly bluish green; slightly greyish; clarity: translucent; cut: fair; treatment: none. Clean specimen; mixed style cut. A variety of chalcedony with layered structure.